I am lucky enough to work in both paediatric and adult trauma centres in Virchester. I think this is a good mix as really nasty paediatric trauma is rare but adult trauma is not. This means that we can transfer our expertise gained from frequent exposure to severely injured adults to the much rarer severely injured children. Such cross fertilisation of protocols, ideas and therapies is (in my opinion) a good thing. Check out the smacc talk from 2013 if you want to know more about the rationale for sometimes treating children as little adults. This week in the Virchester adult department we have had a busy week for trauma. A number of patients in the adult department have had significant bleeding and as a result we have activated our major transfusion protocols involving the use of O-ve blood, FFP, Platelets, tranexamic acid etc. We have also started to use TEG for these patients to allow us to target the management of coagulopathy in these complex patients. This prompted Neil Brain to ask the excellent question…. @EMManchester just at MRI or in the children's as well? @EMManchester I guess we don't see as many bleedy children. Nice to have the option though. I think that’s absolutely true. 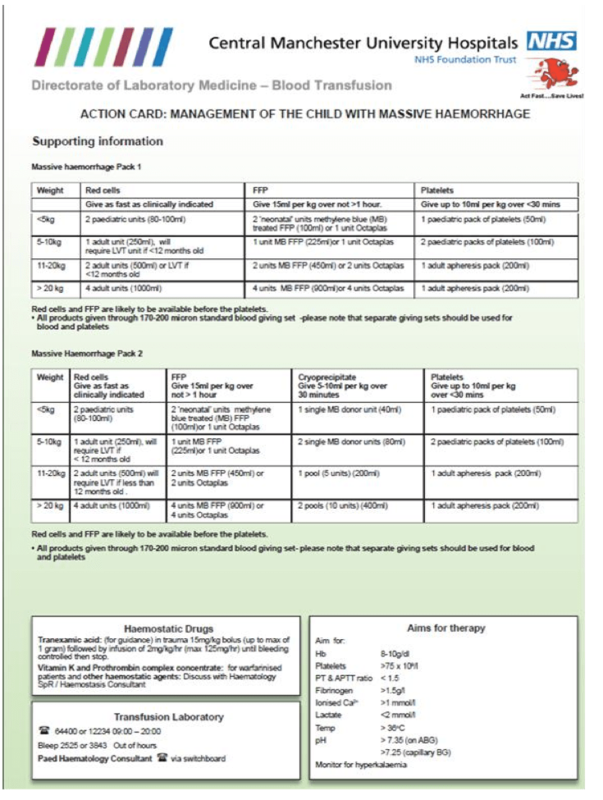 We don’t see as many children with coagulopathy but when we do they are really challenging and it’s worth taking some time to think about how we manage them. As if by magic I came across the following article this week on the use of major transfusion protocols in Children. It’s from the other London (the one in Canada – where I did my elective many years ago) and looks at the experience of massive transfusion protocols for kids between 2006 and 2011. As always I recommend you read the full paper (but it’s not #FOAMed). This is an observational study. It’s retrospective and relies on the authors identifying patients from hospital records. This design is not the best in the world, but is arguably a function of the rarity of the condition (as we will find out later). In general retrospective note reviews are likely to contain significant bias, cases may be missed, data is often incomplete and if they take place over a long period of time the results can be influenced by practice change elsewhere in the patient’s journey. Having said that it is important to consider the type of database being used for patient selection as not all databases are equal! If you search the ED patient database of many UK ED’s then I’m pretty sure you’ll miss many things as coding is not fantastic over here. However, blood bank data is usually pretty robust (for obvious reasons) and so studies such as this are less likely to miss patients. However, once the patients were found details on the incidence of complications such as coagulopathy were gleaned from examination of the (retrospective) medical record. What can we learn from this about incidence? This relates to the questions raised by Neil. 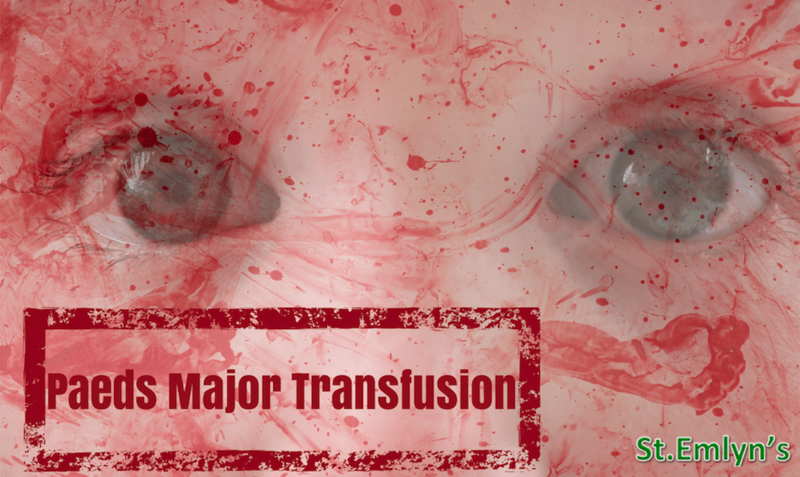 Are major transfusion problems in trauma common – and the answer is no. Of 435 patients with ISS scores >12 and aged <19 only 79 received a transfusion and only 13 of them received a massive transfusion (defined as >40ml/Kg). So 13 patients over a 5 year period means it’s pretty damn rare in London Ontario, and if I reflect on our practice in a UK paediatric trauma centre I think it’s fairly similar to be honest. It relates to the fact that really severe trauma is rare in kids and that’s a good thing, although it probably means that we will be unfamiliar with it when we do see it. This is a 5 year study to get 13 patients. It’s therefore unlikely that expertise is going to arise through exposure. This needs careful thought and planning. I’d be interested to hear of the experiences of other centres around the world about how much they see. Is it just rare in developed nations, the US, Australia? I don’t know but in the UK and Canada it seems that it is rare. In our hospital the only people managing significant bleeding on a regular basis are probably our paediatric anaesthetists in theatre. In a tertiary kids hospital such as ours they are an invaluable resource as the child moves beyond resus. Do we get the same problems in kids with massive transfusion? Obviously with only 13 patients in the database with massive transfusion it’s difficult to be definitive on this, but they did find coagulopathy in 11/13 patients which is not that unexpected. Interestingly only 8 of the 13 patients received both platelets and FFP and that’s evidence to me that during the study periods they were not delivering what we would now recognise as a major transfusion protocol. That’s important to note as it will almost certainly influence the outcome of coagulation tests and thus their estimate of coagulopathy in this population. How could we manage massive transfusion in kids? I’m a big fan of transferrable skills between adult and paediatric major trauma and in our centre we have a cohort of trauma team leaders who manage trauma in both departments. For us then there is a great benefit in matching our processes between adults and kids. This is good practice for the ED, but also for the blood bank. That’s what we do and the pathways below show how we do it. These are very similar in design and actions to the adult protocols. Both involve the early activation of the haematology/blood bank teams and give guidance based on weight. The protocols are available #FOAMed on the web. However, as with all things on St.Emlyn’s as time goes by these may not be current so review and think before using them (the world of transfusion may change at any time). What about TEG and ROTEM in kids? Neil asked the question of whether we can and should use these tests for the management of paediatric coagulopathy. Although not on the card it is something our haematologists are very keen on and so I believe that we will see it being used in the future. Again, I’d be interested to hear on whether other trauma centres are using it in kids. I will certainly be thinking about it when I next see a bleeding child and I think I’ll probably do it (Ed – don’t you have a view on early adoption). This paper is a good example of a paper that does not hold definitive information, but which can help us stop, think and plan. Although the design has its issues I think we can blend the findings with our experience and come to the following conclusions. 1. 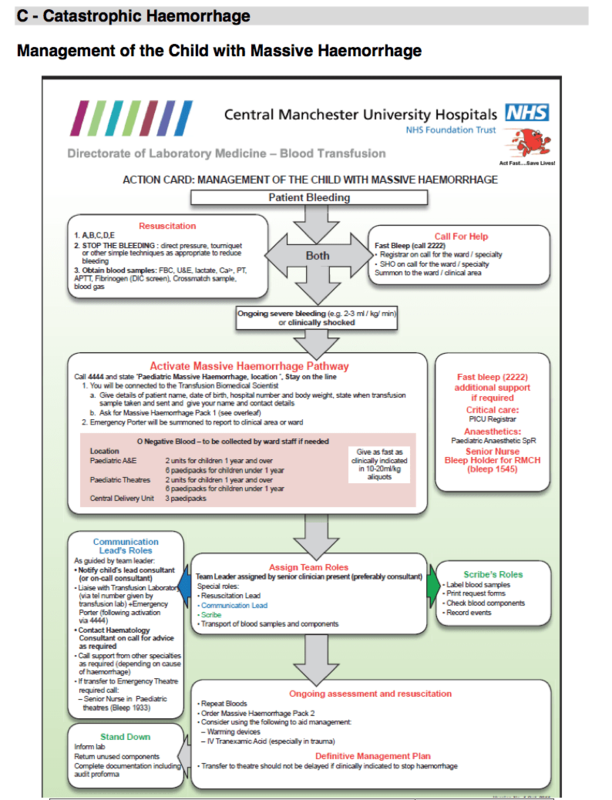 Massive transfusion for Paediatric Trauma is rare in some (probably most) centres. 3. Rare but time critical interventions need planning and training if they are to work well. So, have a think and if you are interested in paeds trauma ask yourself how you would manage massive haemorrhage in kids. Think about it, plan it, discuss it, share it, teach it and think about running an in-situ simulation to test it. Previous: Previous post: TTL podcast 1. Getting to CT in 30 minutes. Next: Next post: How accurate is clinical judgement for acute coronary syndromes?